Not content with being the author of perhaps the best fantasy trilogy to come out of Australia, the multiple award winning and nominated The Creature Court Trilogy (stay posted for a review coming soon), Tansy Rayner Roberts is a scarily prolific blogger who writes with amazing depth and perception on a vast array of topics such as feminism, Agatha Christie, comics and, of course, Doctor Who (for our ongoing series of posts on New Who click here). She is also one of the voices of Galactic Suburbia, a podcast that has changed the way I read and write spec fic forever. It is wonderful to welcome her here to share some tips on world building, and I am sure you will get as much out of it as I have. I first wrote on the ‘worldbuilding as plot’ theme back when I saw the final Harry Potter movie, and was blown away all over again by how clever that Rowling dame is. Wait, is she ACTUALLY a dame yet? Never mind, I’ll wait. At the time, I was thinking very much about my Nancy Napoleon novel, the one I’ve been wrangling with for the last year, which is probably not going to be called “Fury” now because someone else took that title (SIGH). The idea of worldbuilding as plot gave me a stronger sense of what I was trying to do with the novel, and helped me get over the finish line when I had lost confidence (as regularly happens to writers but sadly not predictably so it can hit you at any time). The concept is – well, worldbuilding is one of the essential elements of SF and fantasy, and conveying that world clearly to the reader is one of our more important jobs. But it’s also the thing most likely to get in the way of the story, slowing down the plot and narrative drive with a whole lot of (gasp!) description. But if your plot is directly connected to some of the more important aspects of your worldbuilding, then you get to make that description do multiple jobs, and that is often the secret to really good science fiction and fantasy writing. It feels almost like a cheat. But when it works, the writing simply SINGS. It’s also a great way of pulling a sneaky double whammy on your reader, by making them think you’re just describing the pretty scenery or cool stuff in your world, and later those details turning out to be supremely plot relevant. Harry Potter’s invisible cloak is like that – in book one it is simply a Cool Thing that symbolises that he’s not in the Muggle world any more, in book three it is something that connects him and his childhood to the childhood and personality of his dead father, and helps him forge a friendship with his father’s friends, and we’re told it’s cool and special and useful pretty much all the way up to the final book where it turns out, actually, it’s one of the Three Most Special Things in the Universe. In short, it’s the gun on the table that Chandler tells us about. It’s about taking a crime plotting sensibility and applying it to science fiction and fantasy. To some extent this is why a lot of fantasy stories are about saving the world – because then the world is so important to the story that you simply HAVE to go to great trouble to show how cool the world is. But it’s also where a lot of fantasy falls down – because if you spend four chapters explaining how excellent your magic system is, and then the main conflict in the story is not from the magic system itself… well. Possibly you shouldn’t have spent those four chapters on it, yeah? And now it sounds like a really obvious thing, but very often the worldbuilding is separate from the plot. It’s just a place to put the story in. Which can work fine, but the really great, satisfying-in-the-stomach books are not the ones that do that. I’ve always been a fan of drip feeding information into fantasy stories, sometimes without explanation at all, rather than explaining everything up front. But there are times when that simply can’t be done with any degree of subtlety – there’s just too much alien information to get across. Often when I was building the city of Aufleur for the Creature Court novels, I put things into the city without a clear idea of why they were there other than ‘pretty name’ or ‘cool thing.’ But whenever I felt stuck, or needed to move the story forward, I would go and poke at a piece of scenery and ask important questions like ‘why.’ I didn’t know when I started that ‘the Eyrie’ for instance was an important piece of the Creature Court’s history. And while I knew all along that I was going to spend a good chunk of my final book back in time, showing the origins of the Vittorina Royale through the eyes of a certain small boy, I didn’t know what was going to have happened to the theatre by the time I wrote that part of the story. I had no idea that ‘Bazeppe,’ the third ruling city, was going to play a part in the story at all, and I didn’t know until I got there that they had far more advanced use of post-industrial technology. Believe me, I was as surprised as many of you! Also, when I started, though my characters had a habit of cursing along a particular pattern – saints and angels, saints and devils – I figured that told us something important about their world’s history, and poking at that thought over and over again revealed all manner of societal details to me – of the mythology of their world as told through pantomime, and of the magical secrets hidden in their cities. By the end of the trilogy you’ve seen angels and saints and devils at work, sometimes in several different guises. So I guess my big piece of advice for fantasy writers starting out is – let your world breathe. Don’t nail down all the details early on. Or, if you do, start looking at ways that your world could start (in small or large ways) to go horribly wrong. Because that could be where you find the best possible story to tell. 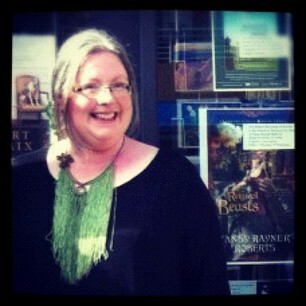 Tansy Rayner Roberts is an award-winning Australian fantasy novelist, blogger, and the mother of two tiny girls. 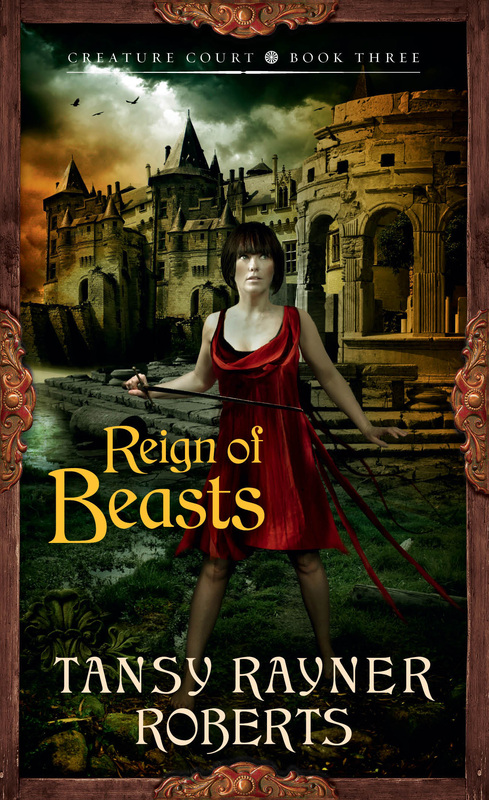 Her recent works are the Creature Court trilogy (HarperVoyager) and Love and Romanpunk (Twelfth Planet Press) She is also one of the voices on the Galactic Suburbia podcast, which provides science fiction publishing news, book reviews and general gossip from three feminist points of view. You can find Tansy at her blog, on Twitter and on Tumblr. This entry was posted in Writing and tagged Tansy Rayner Roberts, Wednesday Writers, world building, writing on March 28, 2012 by David.